Leather jackets as we know them today started out as utilitarian gear worn for work and warfare. From primitive man to the Roman legions, combat GIs, and air aces, leather has been an integral element due to its reliability, versatility and often life-saving durability. The leather jacket came to symbolize the toughness of the warriors who brought them back and introduced them into the mainstream. Over time, they went from being part of standard-issue uniforms, to statements of rugged individuality worn by adventurers and guys with disaffected attitudes and motorcycles. And a legend was born. Hand Built. Made to last. An insistence on highest quality materials, starting with our secret proprietary tanning and leather finishing. Then, cut and sewn by hand in our workshop in Fall River, MA, USA. If you want “Industrial Strength”, don’t settle for anything less than a Vanson. Some people are passionate about what they do, others just show up. 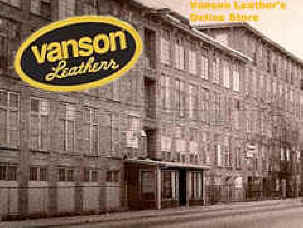 To know what kind of people we are here at Vanson Leathers, all you have to do is look at a Vanson jacket. The quality of the leather is obvious. The care that goes into tanning and finishing and working the leather is evident from the consistency of the color and finish. The craftsmanship can be seen in how well everything lines up. The zips, snaps, laces, Velcro, liners, and even the logos are also perfectly aligned. It takes people who are passionate about what they do to do this stuff. Inferior clones pour out of low-wage mass production factories; but a genuine Vanson requires skill, handwork and a level of artistry we don’t see very much these days. There are 49 steps involved in putting together our simplest jacket…and up to 126 steps in the construction of our most complicated pieces. Each is done by hand. 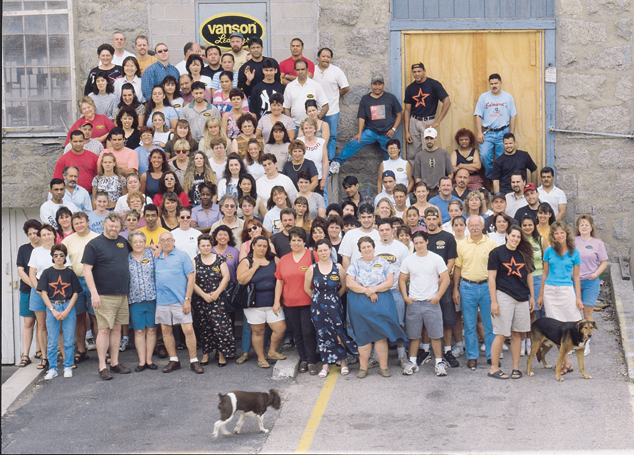 So when we say “Made in America” and “hand-built one at a time in the USA”, we are talking about the dedication and commitment of our people at the Vanson workshop, and their decades of experience. Sure, you may have other lower-cost, lesser-quality options. But if you want the real thing, a genuine Vanson, a practical legacy investment that you can proudly pass down, an “Heirloom”, don’t sell yourself short. Make a statement. Go for the Vanson. Think of the passion of the people who put it together for you. Wear it with pride. The suit is truly a work of art and I will never put myself in another set of leathers as I have now proved that I can walk away from a second 200MPH crash with no injuries – No Damage. TRULY AMAZING!